WhatsApp is a cross-platform messaging application, which is used to send instant messages to the people in your contact list, without paying any cost. Besides exchanging text messages, you can also share images, videos, audio messages and user location with other people. This messaging app is developed to be used with Android, Windows, Blackberry and iOS smartphones. You can also create groups using this app to exchange messages, images, and videos. One can customize the settings for WhatsApp Messenger, according to his/her own preference or comfort usage. There are various setting options that you can customize as per your choice. Out of the list, 7 WhatsApp settings are described in this article that you can easily customize. WhatsApp Notification automatically displays on your phone's screen, whenever a new message is received. Such notifications are a way to inform you that there are new messages in your chat account. 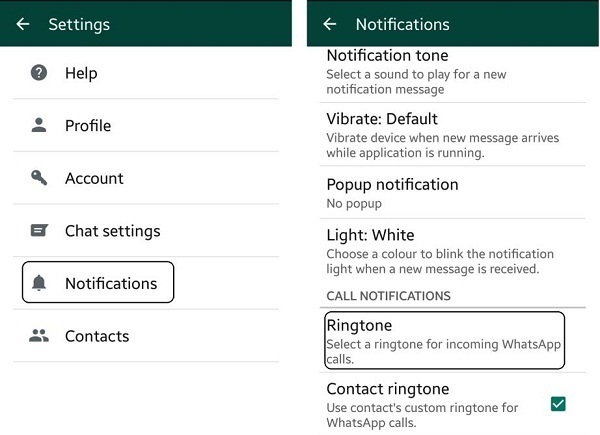 Below are the steps through which you can easily customize notifications in WhatsApp settings. For this, you need to ensure that the notification settings are "On," in your WhatsApp account as well as in your phone settings. Go to WhatsApp > Settings > Notifications, and ensure that "show notifications" is enabled for individuals and groups. In your phone menu, go to "settings > notification > WhatsApp". Now, set your preferences for the alert type: pop-up alert, banners or none; sounds; and badges. Also, if you want that the notifications will appear, even if the display of your phone is off, you need to enable "Show on Lock Screen". The sound volume of the alert can be customized through the ringer volume of your phone. For this, go to "settings > sounds" in your phone menu. You can also set vibrate preferences. Again, verify that the notification settings is "On" in the settings option of WhatsApp as well as your Phone. 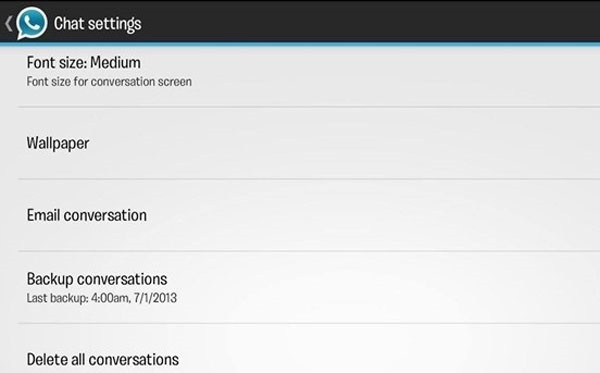 You can also set the sound alerts of the messages for different groups, as per your choice. 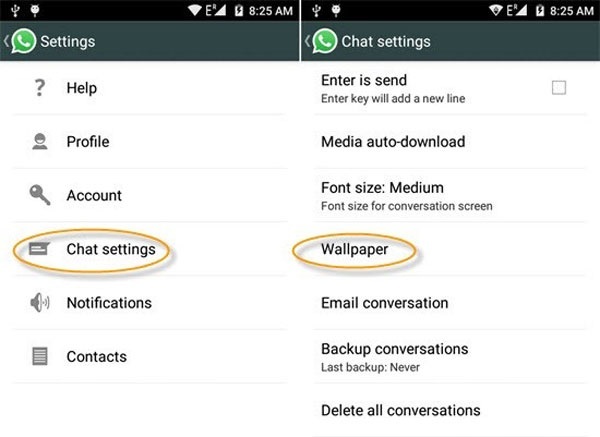 For this, there is an option available in the settings for WhatsApp. Follow the below steps to customize it. In Android phone, for changing the ringtone settings, go to "Settings > Notifications". 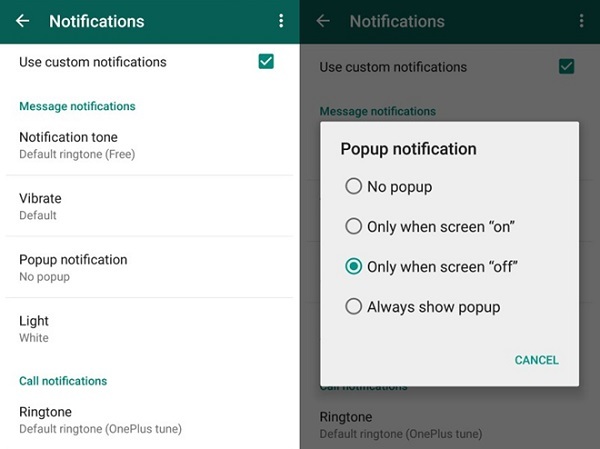 Select the notification tone from your media options. Additionally, you can also set a custom tone for individuals by accessing the details in their chat options. Open WhatsApp, and tap on the conversation of the group for which you want to customize the ringtone. On the conversation screen, tap on the name of the group at the top of the screen. By doing this, the Group Information opens up. In group info, go to "Custom Notifications" and tap on it. 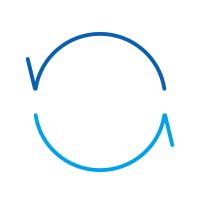 Toggle notifications to "On", to set a new message alert sound for that group. Click on the new message and select the new ringtone for the group as per your choice. Click on "Save" at the right-hand corner of the screen. 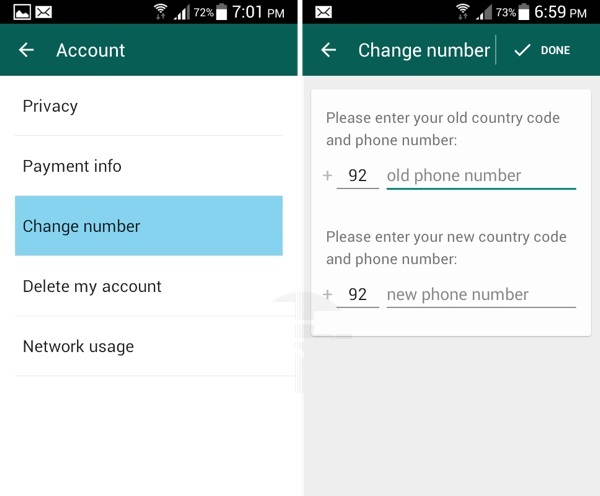 The "Change Number" option in the WhatsApp settings allows you to change the phone number, li_x_nked to your account on the same device. You should use this feature, before verifying the new number. This feature enables you to move account payment status, groups, and profile to the new number. 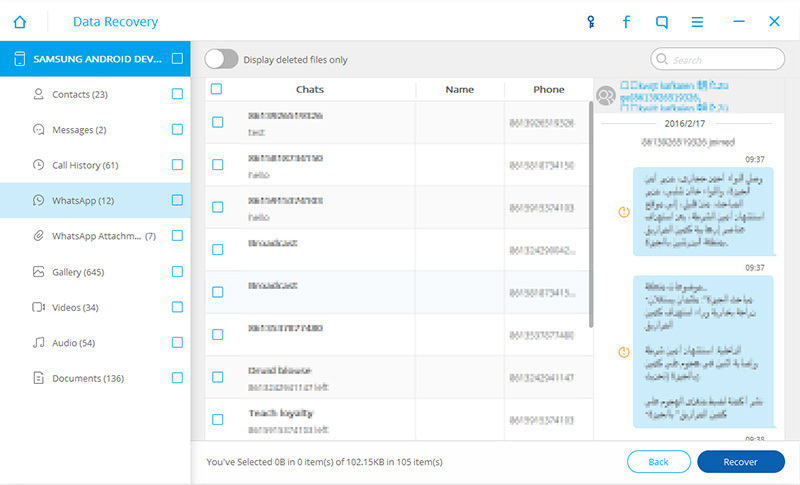 With the help of this feature, you can also preserve and continue the chat history using the new number, until the time the same phone is being used. Also, you can also delete the account associated with the old number, so that your contacts will not see the old number in their WhatsApp contact lists in future. Go to "Settings > account > change number". Mention your current WhatsApp phone number in the first box. Mention your new phone number in the second box, and click on "Done" to continue further. Follow the verification steps for your new number, for which the verification code is received via SMS or phone call. 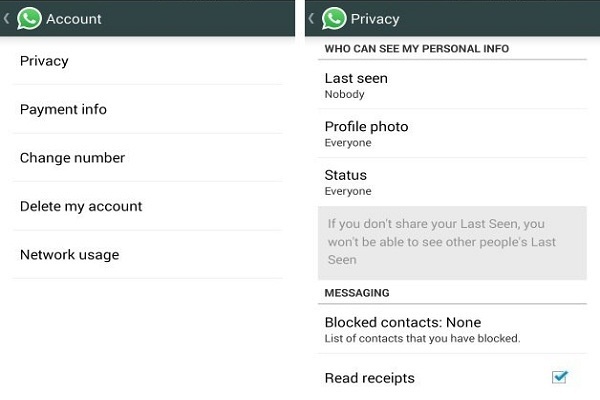 The default WhatsApp privacy settings may be a bit annoying for you. By default, anyone can view your "last seen" time i.e. the time when you were last online. 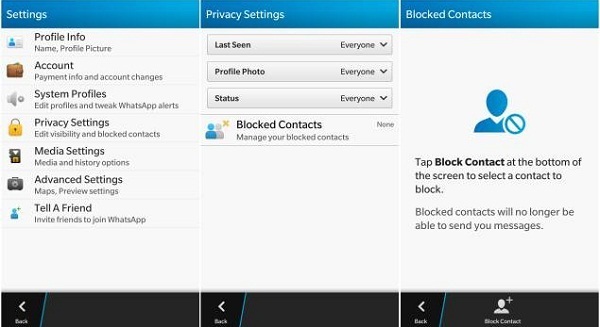 You can customize this WhatsApp privacy settings option, as per your choice. For this, follow the below steps. Go to WhatsApp and choose "menu > settings" in it. Go to WhatsApp and click on "settings". In settings, find out "account" option, and select "privacy" in it. You can change the background wallpaper of your WhatsApp chat according to your liking. By changing the background image, you can make the chat screen good and attractive. Follow the steps to change the background. 1. Open WhatsApp and select "Settings" in the navigation bar. After this, select "Chat settings". 2. Choose "chat wallpaper". Select the new wallpaper by searching through the default WhatsApp Wallpaper Library or from your Camera Roll. 3. Go back to the default settings for WhatsApp. To reset the wallpaper back to the default one, click on the "reset wallpaper" under "chat wallpaper". You can customize the theme of WhatsApp by choosing any image from your camera roll or downloads. You can change the theme by following the below steps. 1. Open WhatsApp, and click on the "menu" option. 2. Go to "settings > chat settings", and click on "Wallpaper". 3. Click on your phone "gallery", and choose your choice of wallpaper to set the theme. When you join WhatsApp, your previous contacts will not get the notifications. However, if a particular person in the contact list refreshes his/her contact lists, he/she get information about your membership. At this moment, you can make yourself invisible, using two techniques. 1. You can block the contact. By doing this, no person in your contact list will be able to communicate with you. 2. Delete the contacts from your contact list. After this follow the steps. These are the seven WhatsApp settings that you can customize according to your choice, whenever you want. Follow the stated steps carefully to customize the settings rightly.